Underground aesthetics, post-punk detailing and Mr. Blobby all made Liam Hodge’s dark and daring AW 18 collection one of the highlights of fashion week. Bringing the world of outsiders to the catwalk, Liam Hodges collections are beloved by the world of luxury fashion and underground sub-cultures alike. Always unique, innovative and daring; Liam Hodges Autumn/ Winter 18 did not disappoint. 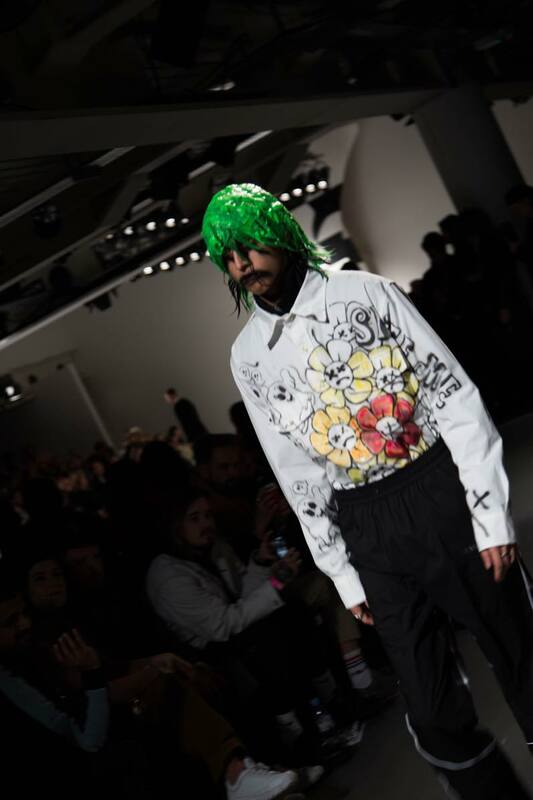 Green, slime-covered hair, clothes covered in personalised badges and graffiti-styled streetwear guaranteed Liam Hodges one of the most dramatic and successful shows of London Fashion Week Men’s. Always inspired to give “an expressive, polysyllabic masculinity”, Hodges brought workwear, streetwear and tailoring together with oversized fits, horizontal stripes and tailored trousers for some truly incredible results. A collection that’s sure to resonate with a huge variety of audiences; From The Streets takes a closer look at some of our runway favourites below. While double-breasted suits were a huge hit on the catwalks this season, none looked quite like Liam Hodges’ version. Boasting an oversized fit, the classic grey colour of the suit is juxtaposed by yellow and white pin badges that detailed logos of Mr. Blobby, crossed out faces and graffiti flowers. Matched with trainers and striped white t-shirt; the whole outfit embodies Hodges signature style of bringing formal and streetwear together for an individual finish. If Hodges unique looks weren’t enough his makeup choices certainly stood out. Green hair and black, spray paint crossed out eyes certainly made a statement. Co-ordinated with matching graffiti trousers, t-shirts, and overcoat; Hodges brought a 70s twist to streetwear through his graffiti flower details. With an oversized fit and high-waisted finish; this outfit is pure Hodges in showing off a messy, underground style that is finished by a simple but effective colour palette and fit. Bringing Mr. Blobby to the fashion world, this outfit truly turned heads on the catwalk. With the classic Mr. Blobby pattern on an oversized knit jumper, this piece is styled with one of the staples of the collection: high-waisted, wide leg slacks. Finished with suspenders and Hodge’s custom pin badges, the fit of this look is probably one of the most unusual of the collection. And yet Hodge’s, once again, collides the world of formal tailoring and oversized streetwear and comes out successful. Watching this pieces move on the catwalk it’s hard to not be won over by Hodge’s unusual and cartoon approach to styling. While denim was certainly downplayed on the catwalk this season, Hodge’s has always been one to stand out from the crowd. Taking some 90’s grunge inspiration, Hodge’s matching denim set shows off a bleached horizontal pattern. A relaxed fit, this outfit shows off an industrial element while being one of Hodge’s most wearable pieces. Simple yet effective, this look proves that while denim wasn’t one of the biggest trends it’s certainly not going away anytime soon.